Roberts Professional Boom Microphone Mic Stand Holder Height Angle adjustable. Maximum Height (Floor to Mic Thread): 162.5cm. - Minimum Height (Floor to Mic Thread): 87cm. - Standard Mic Clip Included. You’ll also find a cable clip on both the stem and boom arm so you can keep your microphone cable tidy and out of the way during use. A folding tripod base ensures optimum stability, even when at maximum height. 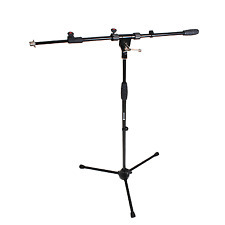 648001 Studiospares Pro Mic Stand/Boom and B500 Bag. About Studiospares. Matte Black Powder coated for a smart and durable finish. Boom includes a cable clip to stop loose cables pulling the microphone. Features: Sturdy and stable designed stand. Adjustable legs for placing on uneven surfaces. Easy to install and lightweight to carry around. Comes with attached Mic clip which fits all standard microphones. Suitable for stage performance, meeting room, school, and public amenities etc. 1x Microphone Boom Stand. Boom length: 27.6" (70cm). Easy to adjust height with quick release clamp. Leg length: 12" (30cm). Stand height adjustable from: 58" - 37" (147cm - 94cm). Adjustable legs for placing on uneven surfaces. 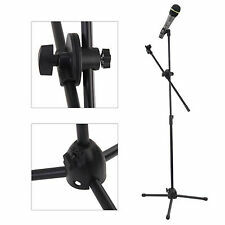 UKDJ Black Adjustable Straight Microphone Stand with Heavy Round Base. When we have received the item back it will be checked to confirm the fault. 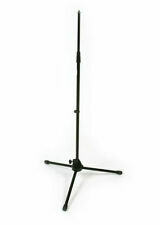 Cast steel base and an extending pole Adjustable from 89cm to 159cm in height, ideal for bands, singers lead and backing, schools and universities. The new Tiger Stackable Microphone Stand is perfect for schools and theatres requiring a heavy weight, solid and durable straight microphone stand for performing use. The key aspect of this stand is that it is easy to put away after use and doesn’t take up a lot of room. 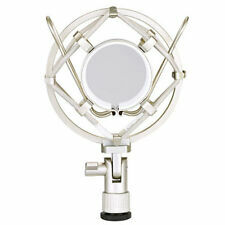 Professional studio shock mount to support large diaphragm condenser microphones. Stable, Tough, and Affordable. 1x Shock Mount. Sturdy and durable. 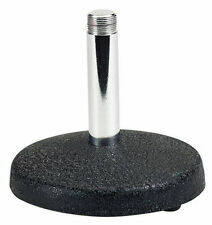 This adjustable heavy-duty, round base mic stand features a sturdy cast iron base with a rubber bottom to protect the floor whilst providing acoustic insulation. - 5/8” Thread. Desktop Monitor Speaker Stands by Gear4music are a perfect accessory to raise all types of studio monitors to ear height for an improved sound. With non slip rubber feet mounted to a sturdy base even heavier monitors can be held securely on the rubber covered top plate. 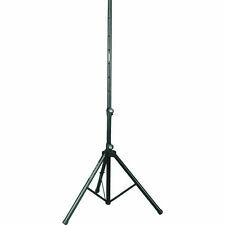 The Stagg MIS-0822 BK heavy duty microphone boom stand has a strong, sturdy tripod base. The extendable stand securely accommodates microphone clips for thin, thick, vocal, condenser & instrument microphones among others. Flexible with a height range of 105 to 167cm / 41.4 to 65.8 in, and maximum arm extension of 55 cm / 21.7 in. Versatile, durable & ideal for a whole host of applications, the Stagg Boom Microphone Stand in black is a popular & affordable choice. Click here for more details. The Micro Boompole Pro is a unique, modular booming device that allows location sound engineers to capture audio in confined or difficult spaces. Optimised for use with the VideoMicro microphone, the Micro Boompole Pro’s three sections combine to a maximum length of 2.2m (7’2”). The tablet holder is adjustable in both length and width, so is suitable for almost any tablet or small device. Adjustable Tablet Holder. Tablet Size:?. 160-270 x 120-192mm. Includes Adaptor for Fixing to Music and Microphone Stands. Thumb screw clamp for boom arm and tripod base. 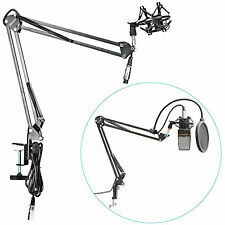 HIGH QUALITY BOOM MICROPHONE STAND FOR AN EXCELLENT PRICE. Boom length: 525mm. Weight: 1.66kg. Microphone Stands K&M Hercules. Condition is Used. Dispatched with eBay delivery – Shutl 1 day. 1 x Hercules small stand. 1 x K&M mic stand. Very good quality and perfect for kick, guitar, bottom snare Hercules stand has a good reach on it for top snare guitar cab mic positioning Fully working. Compact Microphone Desk Stand designed for heavy duty carry. 1x Microphone Stand Holder. Suitable for all the microphone. Folding type, convenient to carry. Material: Plastic. A Short amplifier/ monitor floor stand. Raising your speakers and monitors helps you focus your sound and raise the noise above the crowd. This gets you a better performance and power level from your speaker system. Thumb screw clamp for boom arm and tripod base. 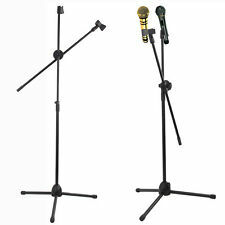 2 xHIGH QUALITY BOOM MICROPHONE STAND FOR AN EXCELLENT PRICE. Boom length: 525mm. Weight: 1.66kg. And the straight bar allows you to adjust the height from 2.6-4.9ft/80-150cm as you required. And the detachable boom arm features 360° rotation and adjustable extension, making it easy to place a mic in front of the sound source. A portable tripod height adjustable laptop stand with adjustable tilt top. Ideal for DJs or Musicians, Presentations and the like, this laptop stand will hold laptops as well as mixers, effects units or lighting consoles, capable of holding a 15 kg maximum weight. The perfect way too keep your prized laptop safe and sound as you work your audience. Order today!. Quantity 2 Mic Holder Clamp Drum (2). Condition is Used. Dispatched with Royal Mail 2nd Class. Studiospares RED301 Stand Isolator available for use with this stand -> 465270". About Studiospares. Height adjustable from 86cm - 154cm. In Person: Access is easy with close proximity to M1 and A5, A41 and A406. Can be adjusted into lots of positions for many uses. These stands are imported by Studiospares in container loads and sold directly to the end user, hence the highly competitive price for a quality product. We hold all spares for this product. About Studiospares. (1 x Microphone Suspension Boom. 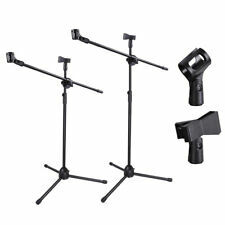 2)Compact microphone stand designed for heavy duty carry. (Microphone Wind Screen Shield Pop Filter is NOT included). 1)Adjustable Clamp can be used in a variety of surfaces. Securely stand / support your monitor speaker or guitar amp speaker for live stage, home performances and more. This fully height adjustable stand offers fine control over height and tilt, along with a locking pin. Constructed from tough metal and finished in black, with a maximum load of 30kg with the distance or width between the supports being 350mm..
1x Microphone Shock Mount. Professional studio shock mounts to support large diaphragm condenser microphones. Color: black. We are alwayswilling to work things out. or order number in all communications. Dual suspension springs on each boom arm made of heavy duty steel tripod design,equip one shock mount can prevent your microphone from shaking,dropping or produce noise. Adjustable Shock Mount Equipped. The Tiger MCA30 Speaker Stand Carry Bag is a versatile, durable and affordable way of transporting and storing your stands. - Length: 132cm. It places your laptop at an angle for easy access while you drop your beats. Holds up to 8 lbs. 1 x DJ Laptop Stand. Stable & Ergonomic Desktop / Tabletop Design. Height Adjustable Assembly. Maximum Device Weight Load Capacity: 5.51 lbs. The stand can be locked in place via the 'C' clamp which is easy to adjust and secure in any position. The angle is adjustable and the stand can be moved left and right to get the viewing position exactly right. The product features tripod style foldaway legs that has remarkable stability when in use. Boom extensions of 760mm. Boom Extends 760mm. Microphone stand Satin Black Mic Clip. Black Non Reflective Microphone Stand. 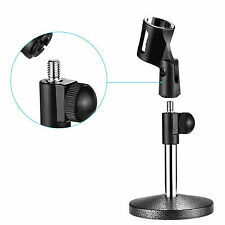 Whether recording your own musicor playing it live, you will have a requirement for some stands and supports to hold such things as microphonesand monitor speakers. There are many different types available, each with its own particular functionality and means of using it correctly. Quality – Recording or broadcasting music relies on quality equipment for the best possible sound to be made. Using a pro audio stand or support helps achieve this level of quality.